Michael is the senior management of a media company, earning a monthly income of HK$125,000. Money is not a big worry for his family. Unfortunately, he has been in the red after losing a great deal of money during the economic tsunami. His financial situation has been worsened as he has to repay HK$33,000 for two mortgage loans each month. This leaves him with no choice, but to use credit card and cash advance services to settle daily spending and other utility bills. In fact, the interest rate of credit card debts is alarmingly high and cash advance service requires extra handling fee. Michael has eventually accumulated a huge amount of debts, which is HK$1,890,000 in total. He can only afford the minimum payment every month. Facing this enormous financial burden, he seeks help from UAF through his friends. 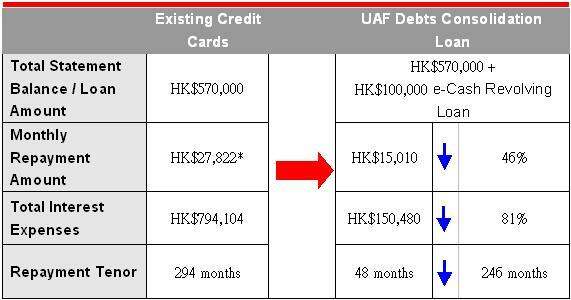 UA offers him a comprehensive financial plan to clear all credit card debts at once with our signature product, UA Debts Consolidation Loan, sharply reducing his interest expenses as high as 81%! Miss Lam has a stable monthly income of HK$28,000 as a marketing professional, but she is a typical shopaholic and usually pays by credit card. Not for long, she has a troubled debts of HK$570,000 and can barely pay the 5% minimum payment amount. 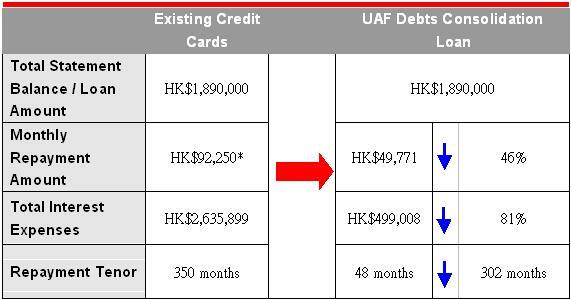 At this difficult moment, Miss Lam finds out from advertisements that UAF’s Debts Consolidation Loan can help her to repay all credit card debts at once, significantly reduce the interest expenses and offer her a flexible repayment tenor as a total solution. Therefore, she finally approaches UA and successfully gets a loan of HK$570,000 to repay all debts within half day. In addition, she is also offered an e-Cash Revolving Loan of HK$100,000 for her future use. As long as she does not drawdown any e-Cash Revolving Loan, no interest will be charged. With the help of UA, Miss Lam only needs to repay $15,010 per month, with a loan tenor of 48 months at an interest rate far below her credit cards, saving up to 81%. * The above cases are calculated based on the assumptions and are for reference only: 1) the credit card minimum monthly payment amount should be equivalent to 5% of the total account balance, 2) the credit card average monthly repayment amount for the first six months is calculated at an annual percentage rate (APR) of 36% and 3) the APR of UA Debts Consolidation Loan is assumed at 12%. The actual repayment tenors and saving of monthly repayment amount, varying from case to case, largely depends on the credit card monthly minimum payment amount and its interest rate.